Flow calorimetry, which is ideally suited for measuring reactions occurring at the liquid/solid interface, has been used to study the surface chemistry of many types of solids, but little use of it has been made in the study of surface reactions of soils. 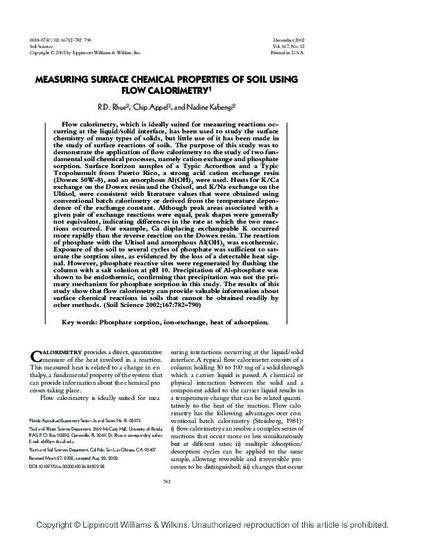 The purpose of this study was to demonstrate the application of flow calorimetry to the study of two fundamental soil chemical processes, namely cation exchange and phosphate sorption. Surface horizon samples of a Typic Acrorthox and a Typic Tropohumult from Puerto Rico, a strong acid cation exchange resin (Dowex 50W-8), and an amorphous Al(OH)3 were used. Heats for K/Ca exchange on the Dowex resin and the Oxisol, and K/Na exchange on the Ultisol, were consistent with literature values that were obtained using conventional batch calorimetry or derived from the temperature dependence of the exchange constant. Although peak areas associated with a given pair of exchange reactions were equal, peak shapes were generally not equivalent, indicating differences in the rate at which the two reactions occurred. For example, Ca displacing exchangeable K occurred more rapidly than the reverse reaction on the Dowex resin. The reaction of phosphate with the Ultisol and amorphous Al(OH)3 was exothermic. Exposure of the soil to several cycles of phosphate was sufficient to saturate the sorption sites, as evidenced by the loss of a detectable heat signal. However, phosphate reactive sites were regenerated by flushing the column with a salt solution at pH 10. Precipitation of Al-phosphate was shown to be endothermic, confirming that precipitation was not the primary mechanism for phosphate sorption in this study. The results of this study show that flow calorimetry can provide valuable information about surface chemical reactions in soils that cannot be obtained readily by other methods.